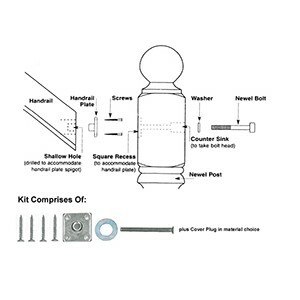 These newel fixing kits are suitable for all most stair systems with a flat base. They are not designed to work with round handrails. Stair handrails can be attached easily to newel posts with this universal handrail fixing kit, as it contains everything you need to securely fit the handrail and newel together. Newel posts are an integral part of any stair handrail and secure fixing is vital. These kits include a long newel bolt, a handrail plate, a washer and four screws to fix the plate to the handrail section. Remember, here at Pear stairs we sell handrail components in all shapes and sizes for any style of staircase, as well as all the other parts you need to complete your stairs.